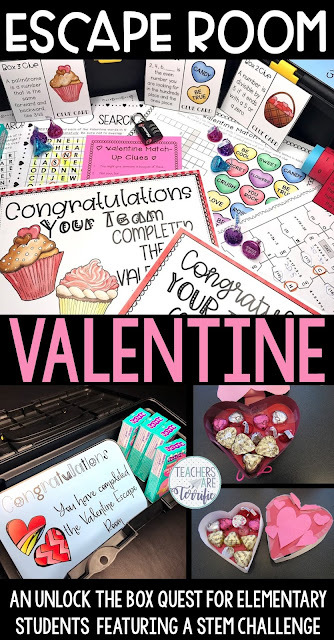 Have you ever had a contest with your students to create a Valentine Card Box? You know, on Valentine's Day they bring in a decorated box for other students to stuff full of cards and candy. And you turn it into a contest to find the best one! This is fun as the teacher, but I always hated it when I was the parent that had to oversee creating that box. I would send in cupcakes or drinks or paper plates for the party day but ask me to make a box. No, thank you! 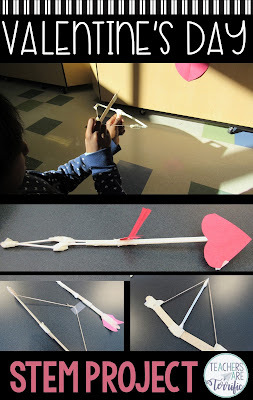 Now that I have been a STEM teacher for a few years I know exactly what I would do for Valentine's Day in a regular classroom! We'd start off with an Escape Room and end with a STEM Challenge- exchange a few cards and call it a day! Let me share a few ideas with you! Have you attended an Escape Room event? The one I have been to was a place that actually locked us in a room. We had to read clues and put together items in the room to solve a puzzle that led to unlocking something- either a door or cabinet where we would find our next set of clues. We had a time limit for "breaking out". Visiting a place like this led me to develop our classroom Escape Rooms. The events in the classroom do not involve being locked in a room! Instead, students use clues to find a lock code which lets them open a locked box to get their next task. 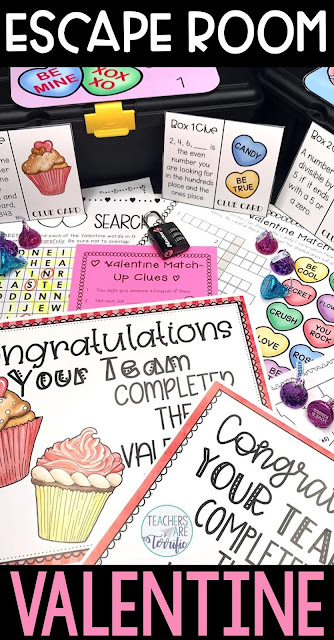 For the Valentine Escape Room, students begin with a matching activity. If they match the right Valentine words to their meanings they will spell a clue word. In this Escape Room, we used a Puzzle Wheel. The Puzzle Wheel is just a series of strips that must be turned until cut out notches are aligned. A set of three numbers will line up when this is done and students use a written clue to determine which set of numbers is the lock code for the box. The second task is to complete a math maze and the third is a word search puzzle. When students solve those two tasks they also find a clue word that will lead them to the Puzzle Wheel and the lock code. It was super exciting to see them racing around to solve the Wheel and then open those boxes. If you have not tried an Escape Room yet, this would be a great place to start! The prep for this one is minimal- just make the puzzle wheels and copy the task sheets for students. TIP: Plan ahead for an Escape Room. My resources have several pages of Teacher's Guides that will give you all the details and how to set everything up. It will take about 30 minutes to make copies, make the puzzle wheels, and set up the boxes for the Valentine Day Escape Room. In this challenge, students must create a passenger car for a Valentine gift. I use a small stuffed heart as the gift item that is being delivered via a zip line. Students must make the gift box and a way to attach the box to the zip line. They test their box on the line and improve if they need to. My third graders love this challenge! I purchased that sequined and stuffed heart at Dollar Tree a few years ago. I know, I know. Who would have kids design a bow and arrow? It's really a clever challenge. Students divide into two groups - the bow group and the arrow group - and create the two separate items. The trick is that the two items must work together. We have enjoyed the competitive part of this challenge. My kids love lining up on the launching line to try their bows and attempt to hit a target. TIP: If you are still thinking this is a bad idea I will let you in on a little secret. The tip of the arrow is made from a cotton swab! My fifth graders love this challenge! In this challenge, students must build a heart-shaped box that will perfectly hold a certain amount of candy. They have candy samples to help estimate the perfect size for the boxes. This is quite challenging! My fourth graders love seeing it on the agenda. I love watching them create a heart-shaped box. They have so many ways of making those hearts. I also love the way they measure the sample pieces of candy to try to make their boxes the right size. Most of the boxes end up being too large because the kids forget about the depth of the box being a factor. It's a great lesson about volume! TIP: Buy the candy for this challenge in a large bag. The samples they use will soften from being tested over and over and you might also have to replace them if a piece gets squashed. I also award the team with the best box with a bag of candy. You know, I taught third grade for a really long time and I loved teaching math. I really enjoyed hands-on math, but sometimes we just needed a worksheet. The extra practice was sometimes necessary. I love the versatility of a worksheet and all the ways it can be used and still provide meaningful work time. Homework, early finishers, math centers, seat work during small group time, or for use with a substitute are some of my favorite ways to use a worksheet. 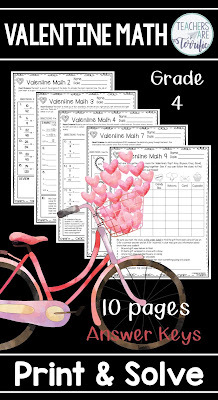 For Valentine's Day I have a set of worksheets for three grade levels. And, here's the best part- each set has some trivia or factual information about something to do with Valentine's Day. Kids love reading these extra little fun facts. The third-grade set has fun facts about candy on each sheet! The fourth-grade set has fun facts about the human heart. The fifth-grade set has fun facts about chocolate. TIP: Choose the set you need and pick a few sheets that would apply to your students during February. Go ahead and make those copies and then grab them easily when an emergency arises- like a sub day or a day, when your lesson runs short. I hope you have latched onto an idea or two (or three) that will get you through the busy month of February. Consider an Escape Room for your class party or a STEM Challenge in those days leading up to February 14th! Have fun!